The Monterey Peninsula is located on the Central Coast of California, 120 miles south of San Francisco and 320 north of Los Angeles. The Monterey Conference Center serves as headquarters for the Health & Fitness Expo. 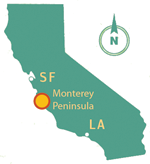 Hotels are located throughout the Monterey Peninsula (cities of Monterey, Pacific Grove, Carmel, Seaside and Marina). Other airport options include San Jose (SJC) 70 miles away, San Francisco (SFO) 110 miles away and Oakland (OAK) 110 miles away. The Monterey Peninsula offers a wealth and variety of lodging opportunities. Click HERE to view our host hotels and partner properties offering special race rates and amenities. For additional direct online booking for all hotels in Monterey County, click HERE. The Monterey Bay Half Marathon takes place in the cities of Monterey and Pacific Grove. Additional hotels and inns are located in the surrounding cities of Carmel, Seaside and Marina, Alternative lodging in the area includes campgrounds, RV Parks and hostels. Contact the Pacific Grove Chamber for hotels along the race route in Pacific Grove.